ThingLink and Discovery Communications, the world’s #1 nonfiction media, have announced a partnership for deploying ThingLink-powered interactive images and display ads across the digital destinations for Discovery Channel, TLC, Animal Planet, Science and other networks in their portfolio. To enhance the partnership, Discovery, ThingLink, and Flite announced an integration of ThingLink inside Flite’s Ad Studio. Flite publishers like Discovery, as well as advertisers, agencies and brands with ThingLink premium accounts, can now deploy ThingLink-powered rich media display ads for desktop and mobile through Flite’s ad server platform. Discovery is driving digital advertising innovation by utilizing Thinglink’s interactive tagging capabilities to enhance their content and to deliver value for partners. By using custom-designed images, Discovery can tell more compelling creative stories that offer clients and brands the chance to integrate more seamlessly around sponsorship initiatives or custom-produced programs. Key to their strategy is organically driving views and engagement beyond traditional advertising techniques through SEO and increased fan engagement that extends to social connections. Discovery will strategically target these new rich media ads to compliment their image-based editorial content thereby creating a cohesive user experience that feels very integrated and blurs the line between content and traditional ad spaces. 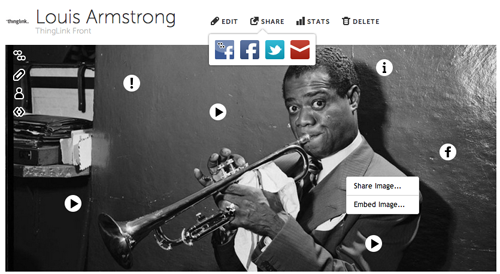 ThingLink’s Premium platform enables publishers to serve 3rd party content over images. 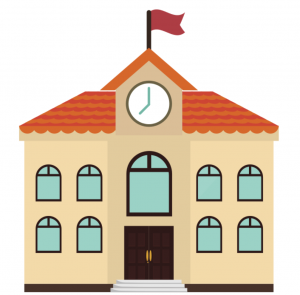 Publishers can use custom graphical icons on ThingLink images and build proprietary in-image applications for shopping, content marketing, and social connection. ThingLink’s real-time metrics allow for invaluable data collection with click-through-rates that continually outperform standards. ThingLink images are also viewable across social channels and web pages and shareable to social channels like Facebook, Twitter and Tumblr. Four of the top ten newspaper publishers and ten of the top fifty global brands use ThingLink for creating and sharing interactive images. ThingLink publisher partners also include CBS Interactive and New York Magazine. Flite empowers their publisher and brand clients to easily publish brand assets and messaging directly into their paid media. 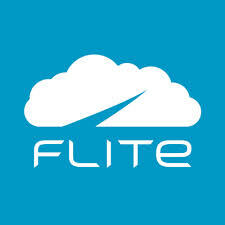 Flite has an expanding library of third party ad components, which allow clients to easily bring in content from providers such as Twitter, Facebook, Youtube, and more. With the added integration of ThingLink, Flite continues to offer interactive functionality within display advertising for both clients and partners. 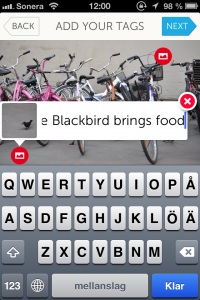 ThingLink Mobile, our iOS app, is constantly evolving and here’s a brand new feature for you. In addition to the ability to add video, text and @twitter IDs to your interactive images, we’ve added the ability to add image on image. Now you can tag a photo with images from your photo gallery. This enables you to tell a deeper story through pictures like the one below, which was created with an iPhone and ThingLink’s Mobile app. 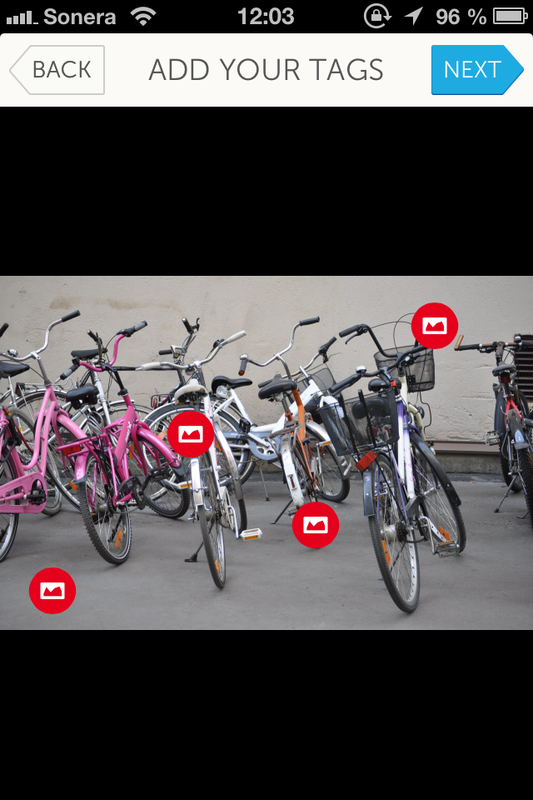 Journalists, teachers, students, event bloggers and iReporters can make full use of the new feature when creating interactive ThingLink images. Now you can tell a deeper story and capture fuller moments. Here’s my story about a Blackbird which had created a nest in an unusual place to feed her young ones. HOW TO BUILD IT: Start out by taking or selecting the image on which you would like to overlay your other images. I had this photo with bikes on it so I started with that to tell my story. 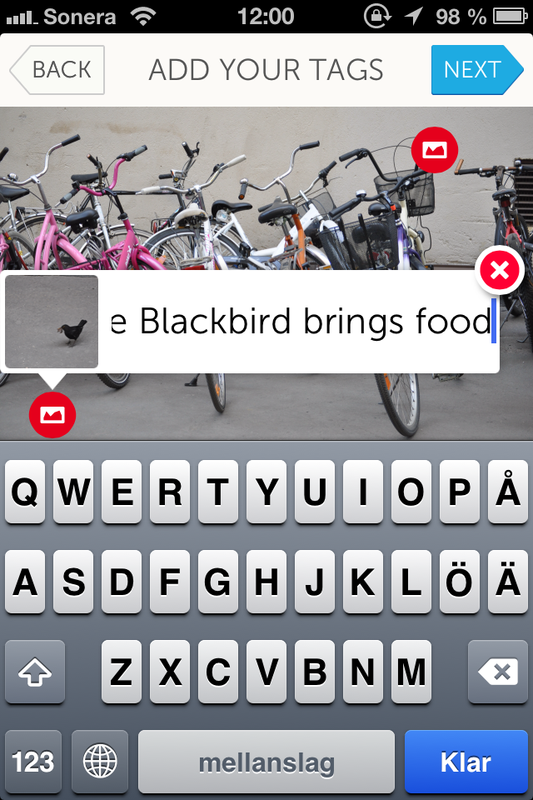 Tap anywhere on the image to add a tag and select which kind of tag you would like to make. We’re doing image on image so head over to your gallery by clicking on “Choose from gallery”. Pick the image you would like to add to the image as a tag. As usual you can add a text tag. Add a few more tags, either using text, video or images, and then you’re done. The image is now shareable to social channels, and browsable either in the app or online at thinglink.com. How are you using ThingLink Mobile? Today we are happy to share a major improvement to the image editor on our web platform at ThingLink.com. You can now use our search functionality to find wonderful content for your images. Your search will query content at Etsy, SoundCloud, Amazon, ThingLink pictures, YouTube and Vimeo. Run your search, click on an item you want to feature in your image, save tag, and it’s added to your image with a preview so you can see what it looks like when hovered. As always you can add a tag description of up to 1500 characters and change the icon to a standard one for free user accounts or a custom one for premium user accounts. If you want your company’s products featured in ThingLink Search, please contact our business development team. 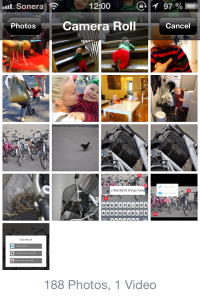 ThingLink today launched its free mobile app, ThingLink Mobile, available for download via the iTunes store, ThingLink Mobile is the first iOS app to let users create interactive images with video players and text instantly embeddable into pictures taken with their camera. The free app for the iPhone and iPad creates interactive images that are shareable to Twitter and Facebook, and are designed to live within the platforms themselves. ThingLink’s web-based app has been used by major publishers and advertisers to increase engagement with their content. The Washington Post was the first news outlet to use a pre-release version of the ThingLink Mobile app, creating interactive images of the White House Correspondents’ Dinner. Even in the beta version, users have found interesting uses for the app including: travel images with details of exotic meals, images of newlyweds with the first dance from the wedding embedded into an image, birthdays that come to life with video, and second hand sellers using videos and notes to illustrate the details of the items they’re retailing. When users download ThingLink Mobile and sign up, they have a free channel for their images at ThingLink.com. 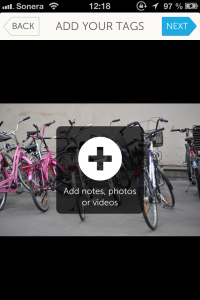 Within ThingLink, users can add additional apps (tags) to their images with content from: SoundCloud, Spotify, Google Maps, Amazon, eBay, Facebook, Twitter, LinkedIn and other sites. Those images are instantly shareable to Tumblr, Pinterest, Google!+, Facebook, Twitter, Edmodo and email. ThingLink’s web-based platform has long been popular among advertisers and publishers for its ability to engage readers and encourage participation. 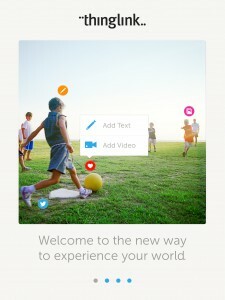 ThingLink Mobile will bring that experience and ability to create compelling personal content to the individual user. People are invited to download the app to make their own interactive images. ThingLink partnered with The Washington Post for coverage of the 2013 White House Correspondents Dinner in Washington D.C.
Post reporters used a pre-release version of ThingLink Mobile to enhance their live coverage of the event. Images appeared in social channels and “The Grid”, The Post’s live experience platform. ThingLink, the most popular interactive image platform for publishers, brands, agencies and consumers, today added interactive image sharing to Facebook Timeline. Now when publishers share ThingLink interactive images to Facebook, viewers can “touch” them to experience the content inside the image — without leaving Timeline. 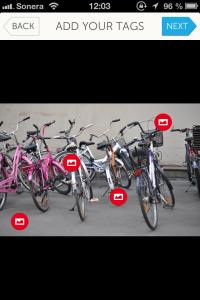 ThingLink’s proprietary, patent-pending web-based solution allows publishers to create, tag and share any image, in any environment, quickly and easily. ThingLink allows content producers to better understand how their images are being used by consumers on the different social media platforms, both in terms of interactions with the image as well as a wide range of social behaviors. Publishers and individuals can now use ThingLink to transform static images on Facebook Timeline into a discovery experience — with music and video players, social links and brand content that appear inside an image when it is “touched.” Rich media tags from services like Youtube, Vimeo, Instagram, Imgur, Flickr, and Twitter are supported from the beginning, and support for custom third-party tags will be added in the coming weeks. Founded in 2010, ThingLink is the leading interactive image platform with over 130,000 publishers. ThingLink’s enterprise level account for publishers, agencies and brands offers such key features as group account management and the ability to create and launch custom image apps and icons that enhance engagement. ThingLink also offers advanced metrics for measuring image performance across social channels like Facebook, Twitter, and Tumblr, enabling valuable, new insights into consumer engagement. For more information visit ThingLink.com and ThingLinkPress.com. How to share your images to Facebook Timeline? CopyPaste a ThingLink url to your timeline. 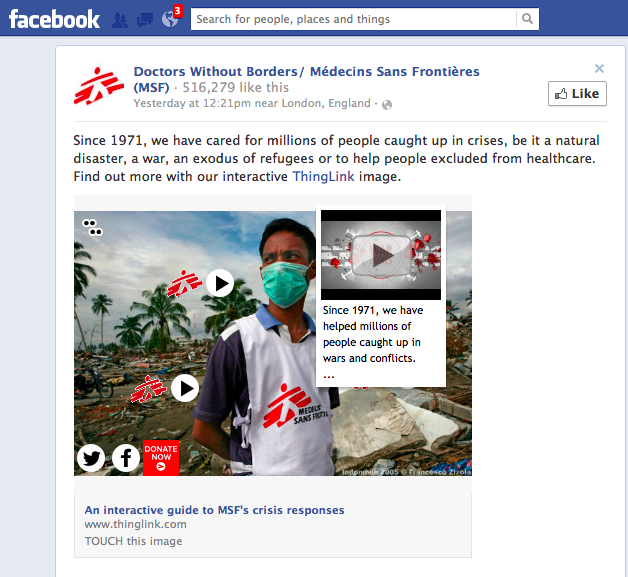 See examples from MSF, Huffington Post France, and Giorgio Armani. How many times have you wanted to take the tags from one image and place them on another? Many users upload several images and want to use the same tags on each one – a twitter and facebook tag, purchase links etc. Until now, you had to manually create a new tag on each image. 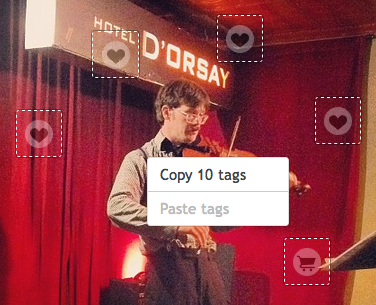 Now you can simply COPY and PASTE tags from one image onto another. Keep in mind that you must have access to both images in your channel. Go to edit the image you would like to copy tags from. Inside the Editor right click anywhere on the image. Choose from the menu “Copy X tags”. Now go to edit the image you would like to paste the copied tags to. Right click on the image and select “Paste X tags”. Voilà! Now you have tags copied from one interactive image to another. 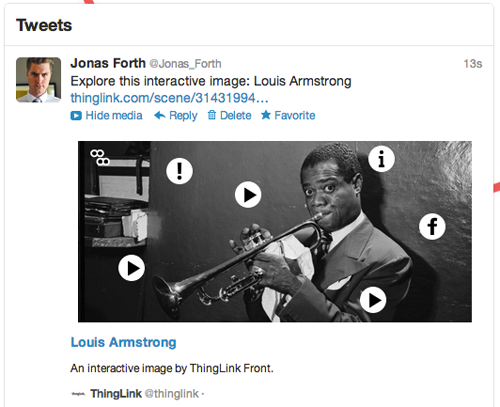 The ThingLink Twitter Card – How does it work? 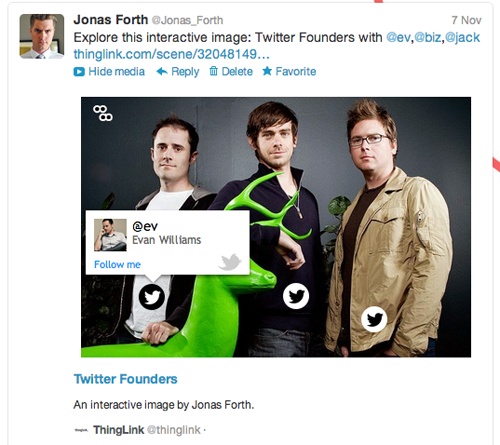 This week we released our ThingLink Twitter Card, which allows anyone to browse the live tags in ThingLink interactive images inside a Tweet at Twitter.com. You can now create an image on ThingLink with in-image links to video and sound players, share it on Twitter, touch the image and interact with the links without having to leave Twitter. This innovation opens up for new opportunities for personal expression as well as marketing opportunities for businesses and brands. 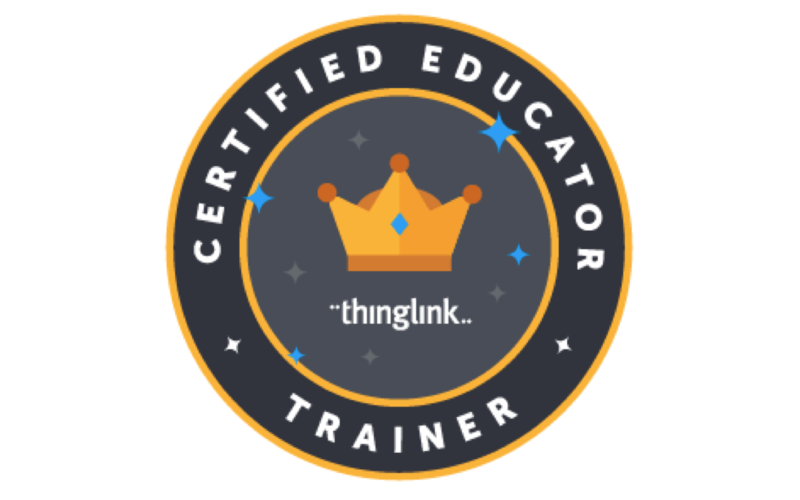 Now if you haven’t already signed up for ThingLink, do it now. We’ll wait, it only takes 30 seconds. Share the interactive image on Twitter by clicking “Share” or “Tweet” on top of the image or right clicking the image and selecting “Share image”. Any user seeing the tweet can now browse the live tags on Twitter without having to leave the image. Click “View Media” and the interactive image opens up. The image is also viewable by clicking the date/time stamp on the Tweet and the status update version of the Tweet will appear with the image and interactivity. The image must be shared from ThingLink.com to be viewable inside Twitter. We also suggest that you set up your own channel on ThingLink to allow for people to easily find other interactive images that you’ve created. NOTE: Twitter is still testing Twitter Cards with certain users/sessions. The ThingLink-Twitter integration works on ThingLink.com, Twitter’s mobile client and Tweetdeck’s web version. Hopefully it will work on third party clients in the future. Twitter will scale down any image that you share from ThingLink.com to 280 or 560 pixels on mobile and 435 pixels on desktop. That means that any messages in the image should be written in larger text and be more prominent for users to quickly see them. It also means that it’s better to use vertical images since the height of the image is not restricted. Visit ThingLink now to create your own account! 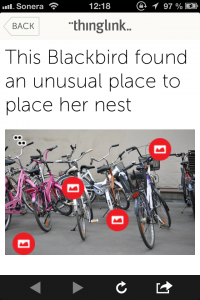 Read more about ThingLink and Twitter @ Mashable and TheNextWeb. 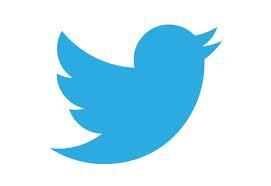 Read What ThingLink’s Interactive Tweets Mean for Brands @ SimplyZesty. With more than a billion people, Facebook is the community of choice for communicating and sharing with friends and customers. A new interactive image tool – ThinkLink Tabs for Facebook – makes it easier than ever for realtors to engage effectively with home buyers and renters. Why should realtors be on Facebook? Marketing expert Laura M. Donovan explains,”94% of businesses are using Social Media to Market. Are you still in the 6%? If you are – you are missing a great opportunity to really get your business, service and brand out to a large group of people, translating into more revenue for your company. 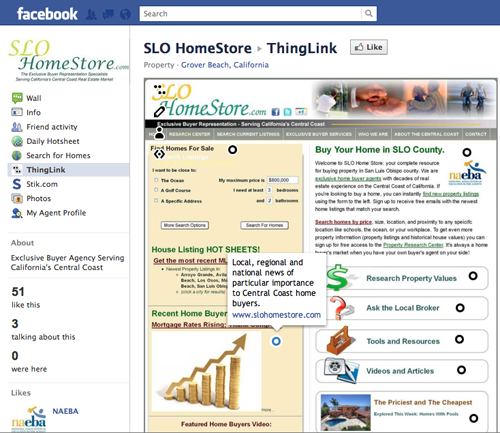 Here are five steps for creating a powerful real estate sales / rental Page on Facebook using ThingLink Tabs. A screen shot, also called a screen grab, is a quick way to capture an image you’ll need to tag for your Facebook page. On a Mac – Use Command-Shift-3. On a PC – Use the “Print Screen” button (may also be labeled “Prt Sc”, “Prnt Scrn”, “Print Scrn”, or similar). Edit your screen shot so it looks like your web page. On a Mac – Open the screen shot using the PREVIEW app. Grab the part of the image that you want to appear on Facebook. On a PC use any image editor and grab the part of the image that you want to appear in Facebook. 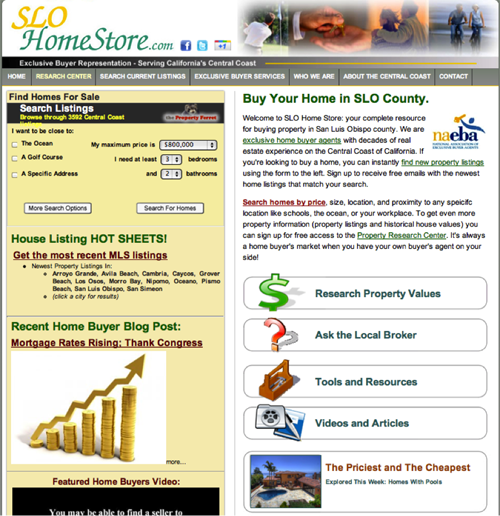 Here is the SLO Homestore.com page. “I improvised by printing the page as a .pdf, converted it to .jpg then cropped it to look like a screen shot,” added Byrd. And here is how that page looks on Facebook. Notice how Michael tagged key part of this image with links to his main website. ThingLink Tabs is your tool for adding links and posting the image to your Facebook page. 3. Import the image into your ThingLink account. Sign up a free ThingLink account. Import your an image into ThingLink following the instructions at the site. ThingLink Tabs is an easy way for realtors to share content inside one image on a Facebook page. ThingLink features an interactive photo editor that lets realtors add tags to any photo. 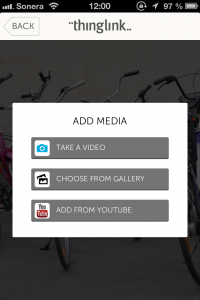 ThingLink’s exclusive Rich Media Tags feature popular media players and apps — from YouTube, Vimeo, SoundCloud, Google Maps, Spotify, FlickR, Facebook, Twitter, LinkedIn, Amazon, eBay, BestBuy, iTunes, Etsy, Mailchimp and FanBridge. Realtors can also create links inside images to anywhere on the Internet. Your image can be posted to your Facebook page with a few clicks of the mouse. Inside the ThingLink editor, simply click “Create a Tab on Facebook” and your image with its links will be transferred to your Facebook page. ThingLink images are shareable with one click to Twitter, Facebook and email, and embeddable (like YouTube videos) into any blog or website. Every account includes metrics so realtors can monitor engagement. No programming experience is required and interactive images can be created and sent to Facebook in minutes. ThingLink images are compatible with all websites, and can also be published and edited on any Tumblr, Blogger, and WordPress.org blog. For more information visit ThingLink.com.